A repository for resources relative to use of the CarmenCanvas Learning Management System at The Ohio State University. Aren’t my files already secure in CarmenCanvas? The short answer is “yes,” but it has recently come to our attention that, under certain circumstances, students can download all the files from a course in CarmenCanvas – even if those files are hidden in the course. That means that if you store old files such as old exams and assignments or answer keys in your CarmenCanvas files, you need to be sure that they are properly secured to ensure that access is limited to faculty and TAs. Note the green checkmarks next to the files that shows that the files are published. To secure a file or folder, click on the green checkmark and a pop-up screen will open. Only available to students with link. Not visible in student files. 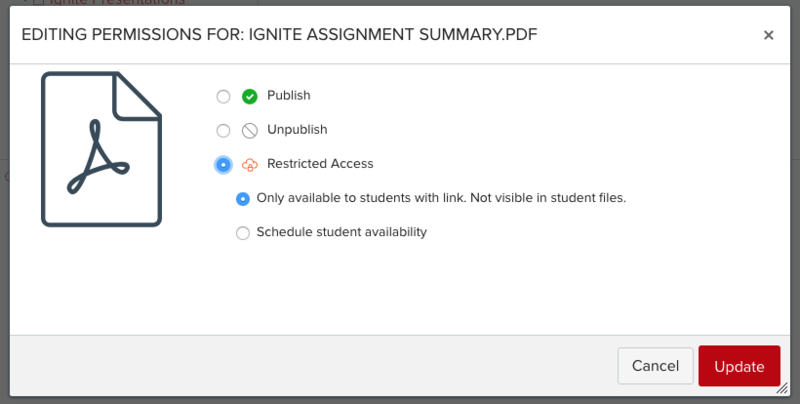 From this set of choices, choose Only available to students with link. Not visible in student files. Then click Update. Create and use folders to organize your materials in CarmenCanvas – Start by storing files by week or by instructor or by topic. This will allow you to secure folders without having to secure each individual file. For example, if you are storing answer keys in your course, you can create a folder for them and secure the folder as shown above. All the materials in that folder will be accessible only to Instructors and TAs without having to secure each answer key individually. Erase all files not in use in this offering of the course – To make the most of your file space, organizational considerations and keeping your materials secured, erasing files from the previous year(s) is a good idea. Only keep the materials from this year in your course.